In my experience, only a tiny fraction of Americans recognize the variety and depth of policies included in the Affordable Care Act. In fact, a vast array of policies reside in the law’s 10 titles, and so many involve interesting and compelling stories. So I’m going to start using this blog as a place to write about many of these stories, and I will call the series “Hidden ACA” so you know what I’m doing. Strengthening Quality Affordable Health Care for All. Title 1 is where the most controversial and well-recognized parts of the law reside: insurance market reforms such as eliminating pre-existing condition exclusions and medical underwriting, premium and cost sharing tax credits/subsidies to purchase private insurance through the public Exchanges/Marketplaces, the individual and employer mandates, and so much more. After a horrible start with the healthcare.gov website disaster in the fall of 2013, federal officials got the system on track providing coverage by this spring to about 11.7 million Americans, about 8 million of whom were previously uninsured. The notion of the health insurance exchange has become embedded successfully in our health system’s infrastructure (including a proliferation of private health exchanges) as the nation moves — smartly or dumbly — toward health insurance as a retail/individual purchase market. The risk pool of enrollees is sufficiently balanced with participation from younger and healthier populations. Private health insurance premiums have not skyrocketed — indeed, private health insurance costs have stabilized over five years at a level unexpected by ACA supporters or critics. Because of this, federal ACA implementation costs have come in substantially below 2010 projections by the Congressional Budget Office. Exchange enrollment has been robust even in the most ACA-intransigent states such as Texas and Mississippi. The establishment of minimum essential benefits to nearly all privately insured Americans has triggered huge benefits for those in need of mental health and substance abuse services, for women consumers, and for those who had flimsy policies. Despite expectations of yet another disaster, the first round of individual mandate enforcement by the IRS during this just-completed tax filing season happened with remarkable lack of controversy. Key concerns are that the subsidies are inadequate for millions of economically vulnerable Americans, and that cost sharing requirements are discouraging many newly insured enrollees from accessing needed medical care (cost sharing such as deductibles has been rising significantly for about 15 years in the US and the ACA established the first set of upper limits on this). There are future concerns about the financial sustainability of the state exchanges, the impact of the end of reinsurance and risk corridors after 2016, and the looming judgment in the King v. Burwell lawsuit. Nonetheless, it’s been a pretty remarkable performance looking back over 5 years. Grade: A-. Title 2 is all about Medicaid, and especially the law’s expansion of Medicaid to all citizens with incomes under 138% of the federal poverty line (about $15,000 in annual income for a single adult) in all states beginning January 1 2014. Because of the 2012 U.S. Supreme Court decision in NFIB v. Sebelius, this expansion was made into an option rather than a requirement for all states. As of today, 30 states (including D.C.) have expanded and 21 have not, with four currently in active consideration. Since the fall of 2013, about 11.7 million have newly enrolled in Medicaid, and between 8-9 million are estimated by the US Department of Health & Human Services to have been uninsured prior to enrolling. Total enrollment in Medicaid and the Children’s Health Insurance Program is now estimated at over 70 million Americans. If all 50 states currently were participating in the expansion, we would see between 4-5 million more enrolled in Medicaid. The expanding states have seen dramatic drops in levels of uncompensated medical care costs, more financially healthy hospitals, and more. One study showed a dramatic increase in diagnosis of diabetes in the expanding vs. the non-expanding states. If Title 2 had been implemented as written by Congress, the grade for this Title would most definitely be an A. It’s only a matter to time before all states join the expansion — my prediction is that all states will be participants by 2020 at the latest. Because of the U.S. Supreme Court ruling, it’s Grade: B+. Title 3 does two major chores. First, it changes Medicare to improve benefits for enrollees and reduces the rate of Medicare spending to finance about half the cost of the ACA’s coverage expansions in Titles 1 and 2. Second, it initiates a varied series of reforms, initiatives, and experiments aimed at improving the quality, efficiency, and effectiveness of medical care as delivered in the US. We need to look at these in turn. First, the Medicare beneficiary improvements — wellness visits, no cost sharing for preventive services, closing the prescription drug coverage gap (aka: the donut hole) — all have happened without controversy. The payment reductions to hospitals, home health, hospice, and other providers are happening as anticipated. And though adjustments have been made to the reductions in payments to Medicare Advantage (Part C) insurance plans, the payment disparity between these plans and the fee-for-service payments through Medicare Parts A & B has been substantially and successfully reduced. Incessant Republican accusations that ObamaCare would destroy Medicare, and Medicare Advantage, have been proven hollow. Second, the delivery system reforms, slowly and surely, as showing positive results. Approximately 700 “accountable care organizations” have been established in Medicare (with accompanying ACOs on the private side), and recent data on the “pioneer” ACOs shows some significant achievers on both cost and quality. Readmissions of Medicare patients within 30 days after discharge have begun to decline significantly (160,00 fewer) in 2013. 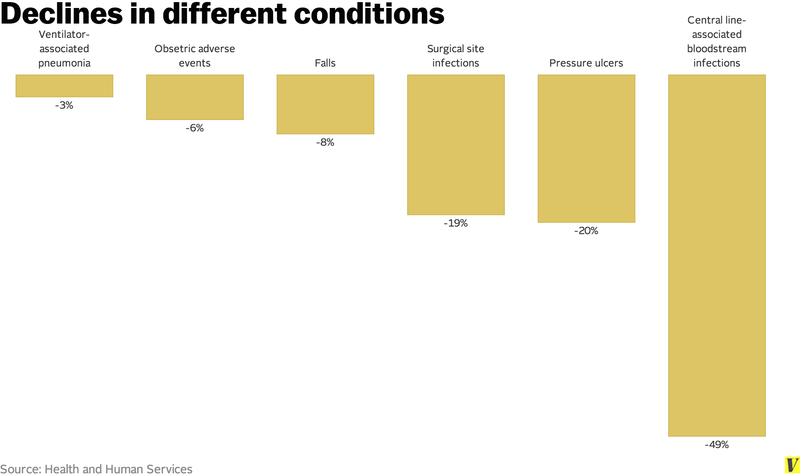 Hospital acquired conditions (infections, falls, and other serious mishaps) have dropped significantly since 2010, saving an estimated 50,000 lives. More broadly, the movement of U.S. healthcare financing away from fee-for-service and toward paying-for-value is happening and accelerating. The results are far more impressive than any of us believed possible in 2010. Still, it’s slow and steady climb and much of the results are still too preliminary for long term judgments. But, here’s a dead giveaway on Title 3. Sens. Orrin Hatch (R-UT) and Richard Burr (R-NC) and Rep. Fred Upton (R-MI) are the influential lead sponsors of the Patient CARE Act which was advanced in both 2014 and 2015 as a Republican replacement for the ACA. Indeed, the legislation would repeal the entire ACA — with ONE fat and juicy exception — it leaves Title 3 totally intact! Grade – A-. Title 4 is all about prevention, wellness and public health. I love this title and it breaks my heart. The Title established a new national Prevention and Public Health Fund with $18.25 billion dedicated between 2010 and 2022, with $2 billion per year after that. But Congress cut $6.25 billion between 2013-21, and a large share of the remainder has been used to supplant funding lost from the budget sequestration process that took effect in 2013. The title also directed the creation of a National Prevention Strategy that was released by then U.S. Surgeon General Regina Benjamin in 2011, a terrific document that has received almost no attention or effective implementation since its launch. Here’s hoping that the new Surgeon General, Dr. Vivek Murthy, can breathe some life into the Strategy and the National Prevention Council, also established under Title 4. Meanwhile, calorie labeling in chain restaurants was supposed to happen within two years of the law’s signing. After a food fight of immense portions over proposed regulations issued by the U.S. Food and Drug Administration over such issues as listing calories by the pizza slice or pie and whether to include movie theater popcorn, labeling will be required by December 1 2015. Too long a time coming. We could be doing so much more and so much better, and my grade: B-. Title 5 is all about the healthcare workforce. The crown jewel of this title was the establishment of a National Health Care Workforce Commission, the first ever, to provide comprehensive and unbiased information to Congress and the Administration on how to align federal resources with national health care workforce needs. The Comptroller General of the GAO was directed to nominate the commission members and did so in the fall of 2010, a talented and exceptional group of workforce experts. Four and half years later, the Commission has never met, and the terms of office of all appointees have expired. Why? Because the Republican controlled House of Representative refused to appropriate the $2 million needed to finance the Commission because it was established as part of “Obamacare.” What a tragedy and missed opportunity! Meanwhile, a large new infusion of $12.5 billion in funding for community health centers and the National Health Service Corps actually happened — mostly. Congress swiped back $3 billion of it in one of the budget cutting exercises. Happily, the recently approved Medicare physician payment law includes another two years of funding for both. Community health center and the NHSC are thriving — and a lot of thanks is due to the ACA. Grade: C+. The Physician Payment Sunshine Act requires all manufacturers of drugs, medical devices, biologics, and supplies to report all gifts and other transfers of value made to physicians and teaching hospitals for publication on a federal website. The reporting, now called Open Payments on the website of the Centers for Medicare and Medicaid Services (CMS) was launched last fall, behind schedule. The data collection and reporting both need improvement and both will happen. Pass. The Patient Centers Outcomes Research Institute (PCORI) was established in Title 6, and it launched in 2011 and has initiated a robust research agenda on clinical comparative effectiveness. PCORI has infused $868 million in new research dollars that helped the research community to absorb other funding cuts to the National Institutes of Health (NIH) and others. Some criticize PCORI’s priorities and lack of headline grabbing results, but it’s up and running. Pass. Deterring Medicare and Medicaid fraud and abuse is perhaps the most important element of Title 6. Partly with the help of these provisions, and significantly because of its energetic focus on stopping fraud and abuse, the first six years of the Obama Presidency have been the most successful ever in combating and deterring those who want to steal money from these programs. Importantly, the focus has shifted from just chasing bad guys with sacks of cash to preventing bad guys from stealing the cash in the first place. Lots of encouraging progress that I’ll examine in a future post. High Pass. 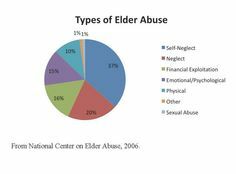 The Elder Justice Act, a bipartisan effort to upgrade and coordinate national and state efforts to avert physical abuse, neglect, and financial exploitation of senior citizens, represented the achievement of more than a decade’s work, a milestone achievement for both Republicans and Democrats. And, Congress never appropriated the money to realize the Act’s ambitions, and the ACA’s authorization period has expired. Big Fail. Overall Title 6 Grade: A-. Title 7, for the first time, authorizes the U.S. F.D.A. to approve the manufacture, marketing, and sale of so-called “biosimilar products” in the U.S. pharmaceutical market. Biosimilars are generic-like versions of biopharmaceutical drugs, the major growth area of the global pharmaceutical industry now. 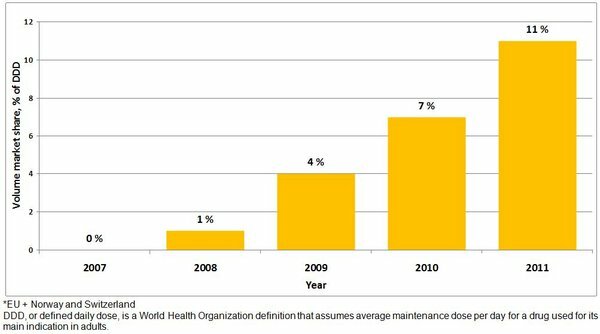 The European Union, Japan, Brazil, and many other nations permitted biosimilars way before the ACA opened the door in the U.S. so we are playing catch up (the chart below shows the growth in the EU market). Both Democrats and Republicans strongly supported this policy during the ACA legislative process — with big disagreements over how many years drug makers could keep their data secret. Big pharma and biotech wanted at least 12 years of data exclusivity, and almost everyone else — business, labor, consumers, insurers, providers — wanted no more than 5 years. I won’t tell you who won — just know that the final number was 12! Just this past March, the F.D.A. approved the first biosimilar for the U.S. market, a Novartis copycat of an Amgen cancer treatment. Amgen is fighting in court, of course. Biosimilars will become an important and growing part of the U.S. pharma market in the next decade. While F.D.A. is starting to approve these new agents, they have yet to issue regulations to guide the process, so let’s knock their grade down a mark. Grade: A-. Title 8, Community Living Assistance Services and Supports (CLASS) was the personal priority of my late boss, Sen. Edward Kennedy, who wanted to create a new way for Americans who are temporarily or permanently disabled to get cash support to enable them to live independently in the community. The design of Title 8 was flawed in significant ways. Bottom line is that it’s perilously hard to establish a voluntary insurance program anywhere, and especially in the domain of long term care — and a mandate on top of Title 1’s individual mandate was inconceivable politically. Rather than attempt to fix these flaws, which some thought feasible, Congress and President Obama repealed Title 8 in toto in legislation signed in January 2013. America needs to figure out a better way to help Americans with disabilities. Grade: F.
New taxes and fees on pharmaceutical makers, medical device manufacturers, and health insurance companies. Lots of ongoing controversy has erupted over several of these, especially the medical device tax, the “Cadillac” tax, and the health insurance tax — all now subject to aggressive repeal campaigns. The central weakness of all the repeal campaigns is how to replace the lost revenues or savings. One section that required annual reporting by corporations of payments to consultants was repealed in 2010 because of business backlash. The big Kahuna in this title is the new Medicare tax — accounting for about half the Title’s total revenue. Had the ACA been bipartisan, there’s no way on earth this would have survived the legislative process, especially the taxes on unearned income — a dream fantasy for Democrats and a nightmare for Republicans. If you ask me why the Koch brothers, David and Charles, despise ObamaCare so much, I point to ACA section 9015, right there! As we saw in the recent Medicare physician payment legislation approved by Congress last month, it’s always so much easier to pass legislation when you don’t have to pay for it! So much more fun. In that recent bill, Congress lathered $140 billion onto the federal debt and never would have passed anything like it but for Republicans and Democrats closing their eyes, joining hands, and passing the tab onto our children and grandchildren. So, no matter how much you may despise any or all of these Title 9 provisions, how about at least a patina, a dab, of respect for the Democrats in Congress who passed comprehensive national health reform and had the integrity and political guts to pay for it? So David and Charles, please take note: Grade: A. 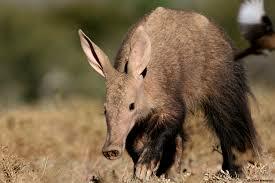 Title 10 is the law’s aardvark (see below — one of a kind). Because of the unprecedented political controversy during the ACA legislative process, it was not possible for Democrats, as the legislation proceeded through the Senate, to add amendments by substituting a new draft. The only way to get through the process was for Democrats to add their final set of amendments to the bill by adding a single separate title knows as Title 10, and sometimes called the “Manager’s Amendment” (the manager being then-Senate Majority Leader Harry Reid (D NV)). Team Obama refers to Title 10 as the Indian Health Care Improvement Act, and it’s true that this is the largest single element of a title chock full of them, though virtually all flow back into one of the nine previous titles. So let’s dispense with a grade for this one. And similarly, after Congress passed the President Obama signed the ACA into law in late March 2010, they followed up by passing and approving a follow-up law, the Health Care and Education Reconciliation Act of 2010 that consists mostly of changes to Titles 1-10. In any official version of the ACA these days, all the HCERA changes are embedded into the full text. So no grade here as well. My summary grade for the ACA at five years: A-. The alternative grade I would consider would be “incomplete.” Any law of the scope and magnitude of the ACA is a work in progress that never ends. If the 1935 Social Security Act or the 1965 law creating Medicare and Medicaid had never changed since their signings by Presidents Roosevelt and Johnson respectively, we judge them failures today — good for their respective times, and utterly inadequate for today’s society and needs. 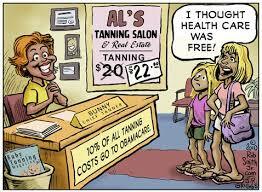 And so it is with the ACA. The signing of the law in March 2010 by President Obama was the end of a long period of struggle to achieve some form of comprehensive health reform. It is only the beginning of a new period and process to fix, improve, adjust and modernize the ACA to fit the always changing needs of our dynamic society. Thus far, I contend that the ACA stands the test of time, though not forever. That’s up to the next generations, up to my students, up to all of us and all of you. Let me know what you think of this assessment and I’ll post the most compelling responses.